I felt really wonderful about how the musical turned out. It captured the APO spirit and made people laugh, cry, get nostalgic, and it brought them to a new experience and appreciation of our music. Last weekend was quite an emotional one for me. It was because Eto na! 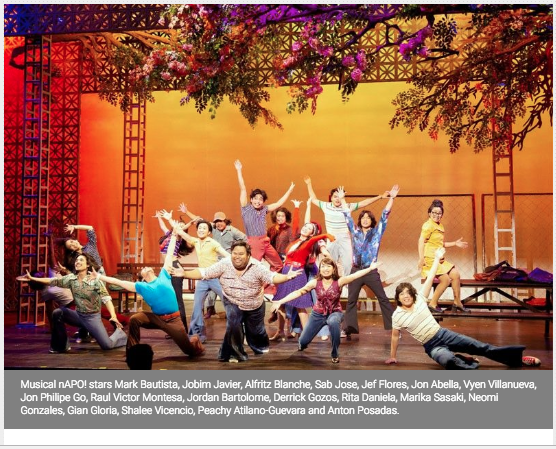 Musical nAPO, the stage musical, opened at the Maybank Theater last Thursday. Boboy and I, with a few friends, bought the Sunday night showing and invited all our close friends and the public who wanted to join the special night. Old and new friends showed up. Many of the people who were already present early in our career as APO, and fans who have stayed with us all this time, were present. Our relatives, their children were all there to watch the musical that has been getting standing ovations ever since it opened. It was a sentimental night. It reminded us of how long APO has been making music. I felt really wonderful about how the musical turned out. It captured the APO spirit and made people laugh, cry, get nostalgic, and it brought them to a new experience and appreciation of our music. We wanted our friends to enjoy what 9 Works Theatrical, Globe Live Events and the whole production and cast had done to our repertoire. They made the songs new, fresh, magical and more beautiful than I had ever heard them. Right after the play, as people were leaving the theater to go to the lobby, two people approached me and asked me how I felt at that very moment. I was taken aback. I had no words. I thought for a while and said that I felt happy that people recognized how APO had built quite a formidable catalogue of songs worthy of becoming a legacy. I was proud but humbled, ecstatic but reflective at the same time. I still remember when we wrote the songs and recorded our albums. I remember the creative processes that happened in the studio. We were not sure of what we were doing; we were often shooting from the hip. We embarked on making a career in “Pinoy pop” without a template even existing then. In a world where the goal was to imitate foreign artists by singing covers, we wanted to do our own songs, and sing in Tagalog! Our aim was to make songs that Filipinos would sing and love and use as themes of their everyday lives. Unsure as we were, we just plodded on. We felt that if the songs we created pleased us, then they would probably please other people. We believed in our own instincts. Many times, we were proven right. Not all the songs we recorded became popular. Far from it. We actually had more misses than hits. One of the things I have learned is that a songwriter’s job is to go for quantity. For every song you do not write, you deprive yourself of a possible hit. Don’t wait for outside inspiration. Learn to tap the fire within you. Just do the work. If you have to wait to fall in love to be inspired, you will create very little. Just write. Do not judge the songs. God will take care of the quality. I have been writing songs for five decades. In the past five years, I did two solo albums. More than for any other reason, I wrote and recorded them because that is what a songwriter does. I try to keep it that simple. In short, I do not put too many conditions when doing what I enjoy doing. To ignore or suppress the urge to write and bring forth these songs to life would be to commit creative abortion. Songs are creations. They are living things. These creative seeds are entrusted to me and it is my duty to take care and give them a chance to shine and be heard. Even if at times I can be extremely critical of my work and sabotage my confidence, I try to allow the thoughts and feelings that come to simply flow and let them be what they were meant to be. Every song in the musical is wonderfully received by the audience every show. Before they were part of the musical, they were hit songs that sold well and got a lot of media coverage. Some of them had been interpreted by other artists. Some of these artists even became famous because of them. Seeing these “pre-loved” songs come alive onstage performed by new singers was such a treat for me. When we were just starting, we never thought we would actually build a body of work like we did. We just did things almost spontaneously. When we thought we had written a batch of songs, we would go to the studio to record them. All in all, we released about 27 albums including compilations of hits. When we record an album, we often have our favorites that we predict will become hits. We put a lot of effort into them. We fall in love with them. But quite often, these songs we heavily betted on end up ignored. Meanwhile, the unexpected ones, those that we simply recorded without expectations or great effort, end up taking all the glory. This is one of those “mysteries” that no one has really figured out in the record industry. We can only laugh. I think the secret to building a legacy of any kind is to approach what it is you do with love and passion. Without them, you can’t breathe life into anything. Love is in the details. Always. Passion is the effort you put into the work. You cannot love generally; love is specific. Acts of love are always nuanced. A song is an expression of a unique feeling. As a songwriter, I believe that the more “localized” or defined the feeling, the more people can relate to it. Songs are, after all, emotional “stories.” And people like these musical stories with truthful details written with some poetry. I do not think I will ever be ready to retire from songwriting and performing. Boboy and I still do shows and events occasionally. I also have been doing solo shows for sometime now. Last month, I did two solo performances for a mostly foreign crowd in Sydney. I sang my original songs in English and Filipino plus a few generally popular songs. Guess what? I got more positive reaction doing my own originals. The newness did not seem to alienate them since I would tell them what the songs were all about. They were warmly received. The love, passion and authenticity I put into them must have crossed the language barrier. It was not the first offer we had received. Many individuals had approached the APO with plans to launch a new musical based on the hits we had made through the years. A movie called Idobidobidoo was created some years back which was based on APO’s hits. But APO’s music had never been used in any theatrical production. There were a few people who approached and presented us with rough storylines. Some sought our permission without anything concrete on paper. None of them grabbed our attention. Around five months ago, Robbie Guevara, Anna and Santi Sta Maria of 9 Works called for a meeting to interest me in a project they had in mind. 9 Works had been doing theatrical projects for almost a decade, successfully producing plays and musicals in English, including popular Disney theater shows. They recently restaged Himala earlier this year to critical acclaim. For the rest of the year, they wanted to do something they had not done before. They wanted to create an original musical and they thought that APO’s repertoire was the right material to play with. During that meeting, they ran the story by me including how the songs would fit in. Rough as it was, I liked what I heard. 9 Works had also talked to Boboy and Danny about the project. It did not take long for us to agree and give our go signal. About a month later, Robbie invited me to sit through a reading to see my reactions and give suggestions. The story was simple. It was about a barkada in college circa 1975 that wanted to participate in a singing and songwriting contest. The plot is interspersed with the love stories of the cast amidst the martial law years. Robbie wanted to hear my comments about the characters and the plot and ask me more about what life was like during that era. The reading I attended featured a slightly modified script that had already been developed from the one they’d sent earlier. It had new elements. I liked it. But Robbie knew it needed a lot more revisions before it was ready for a paying audience. Some weeks and 21 revisions later, he invited me again, this time to watch the rehearsals. I was so elated with what I saw. The script and the music were a great fit. The story line was clear. The unraveling of the plot was exciting. The characters were distinct and quite lovable, and the few songs they had already arranged were uniquely and beautifully interpreted and performed. The musical was clearly coming to life in a wonderful way. I’ve always believed that to entertain people is to surprise and delight them. The aim is to let them experience something that is not only new but like no other. I wished everyone involved good luck and left for Sydney a few days later. I came back last July 31. Three days ago, I finally watched the musical on stage. Before the show, Robbie told me I was about to watch revision No. 33. Quite honestly, I was not prepared to see what I saw. I was more than surprised and delighted. I was ecstatic! From the last rehearsal I saw a month earlier, it had transformed into a wonderful stage musical with amazingly beautiful and solid musical arrangements by Orly de la Cruz and Daniel Bartolome. The choreography by PJ Rebillida was delightfully brilliant. The entire cast showed great singing, acting, dancing and wonderful comic timing. There were so may highlights in the show. Everything worked flawlessly. There were no scenes or performances that were lacking. The whole musical was superb. Overall, there was that feel-good quality served in generous servings that knocked the audience off its feet. I felt that the whole creative universe that we in the APO had inhabited through the decades when we were performing and writing our songs was explored to the fullest. The humor, angst, wit, lightness and seriousness, the bold spirit and originality of OPM, the Filipinoness unfolded magically on stage. The audience responded with a standing ovation. Alas, I must stop right here since I am obviously a biased source. Instead, let me quote reactions from members of the audience. “I went down memory lane tonight through APO’s music, the soundtrack of my youth. I really enjoyed watching friends hamming it up, prancing about and being emotional on stage. Benta ang mga jokes! Saka yung scene ni Raul Montesa sa huli, panalo! Iba talaga ang music ng APO. 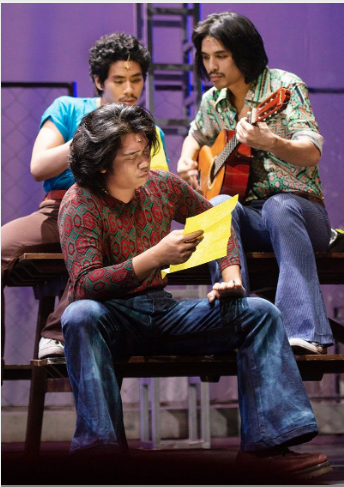 Magaan sa tenga.” —Raymund Concepcion, theater actor (father of actor Sam Concepcion, and Red Concepcion, the new “Engineer” in the US touring cast of Miss Saigon). After the show, a millennial told me, “Frankly, I did not expect to connect to all the songs” (since most were written before he was born). “But I did.” It was a delight to hear that. I want to give special thanks to the Globe Live Team for being co-producers with 9 Works amd suppoting creative endeavors such as this. I thank 9 Works’ Santi and Anna, Robbie Guevara and Jon Jon Martin and the entire effort that brought all this to life. The musical runs all weekends of August. Tickets are available at Ticket World. There are matinees and evening shows on some days. Do not miss this! You won’t be sorry.